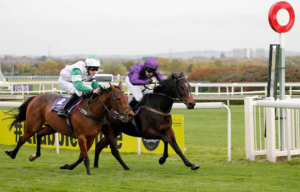 Pony Racing is held under the Regulation of the Pony Racing Authority [PRA] and the allocation, cancellation and alteration of Pony Races is authorised at the discretion of the British Horseracing Authority and Pony Racing Authority. The Pony Racing Authority will administer Pony Racing under these Regulations and will exercise control over those taking part in the sport. These Regulations which are correct at the time of going to print and may be subject to change by announcement on www.ponyracingauthority. co.uk, relate to any Pony Racing Authority recognised Pony Races with differences in Regulation colour coded. Changes to Regulations for the current season appear in bold. Regulations that have been deleted no longer appear. Changes to definitions have not been highlighted. In all instances the initials PRA refer to the Pony Racing Authority and the Stewards and Officials who have been appointed and publicised for each event by the host organisation. All such individuals are permitted to ensure these Regulations are complied with and have absolute authority from the PRA to act accordingly to ensure compliance and Regulation. Do you have the correct equipment? You don't need a lot of specialist equipment to pony race. Find training days that are coming up. Are you already qualified to race?